Boxing: News, reports, reaction and more. CARSON Jones has vowed to punish Kell Brook in Sheffield when they meet in an IBF welterweight title eliminator on July 7 - after Brook predicted he will KO the American. Brook and Jones clash at the Arena and Brook raised the stakes last week when he promised to knock out the Oklahoma fighter to claim a shot at the title. Rated one spot higher in the rankings than Brook at number three, Jones travels to England for the first time in his career and says he’ll make the Sheffielder pay for calling him a quitter and grab the title chance for himself. Jones said he wasn’t impressed by Brook’s destructive 12 round win over Matthew Hatton and Brook himself admitted that he needed to be nastier against Jones – and the visitor has his own take on that claim. “I agree we will see the nasty Kell Brook, because after I beat the hell out of him his face will look very nasty,” said Jones. The 25 year old has stopped his last eight opponents on his way to facing Brook, and the USBA champ has got his eye on another British fight should he beat Brook in his backyard. Brook versus Jones tops a huge night of boxing in Sheffield, with that headline bout one of five title fights. 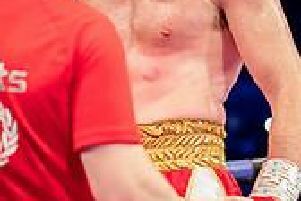 There are two European title rematches as Gavin Rees defends his lightweight crown against Derry Mathews while Greg Proksa attempts to win back the middleweight belt against Kerry Hope. Lee Purdy is back on the hunt to regain his British title and continues on that path with an English title defence against Chris Jackson while hotly tipped Dudley middleweight Ryan Aston fights for his first title as he fights Nottingham’s Curtis Valentine for the vacant Midlands Area belt. Tickets for Kell Brook vs. Carson Jones featuring Ryan Aston’s first title shot are on sale now priced £30, £40, £60, and £100 from the Motorpoint Arena Sheffield box office on 0114 256 5656 and at www.motorpointarenasheffield.com.